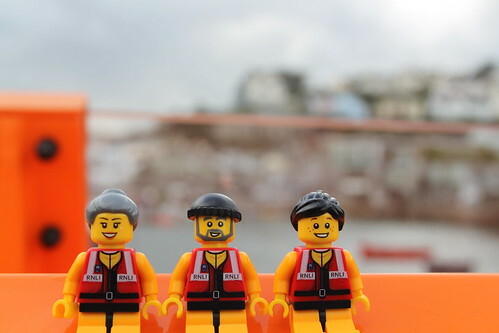 In last week’s blog post, I wrote about the little guys’ visit to the RNLI lifeboat station in Salcombe. 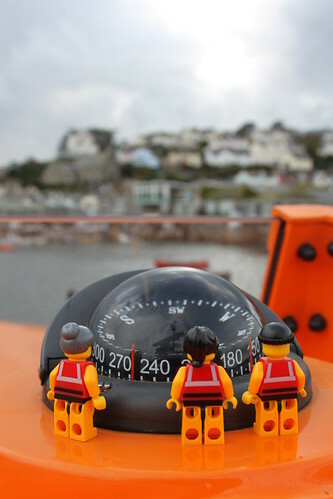 Salcombe crew member and volunteer press officer Matt was showing us around the station, including the fantastic museum and lifeboat centre. 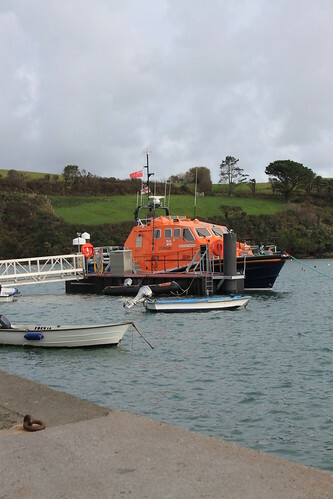 But that wasn’t the half of it, as next up on our tour was the station’s all weather lifeboat, the 16 metre Tamar class ‘Baltic Exchange III’. The boat lies at her own pontoon just a few metres from the station, so we were soon clambering aboard. And the crew lost no time in making themselves at home. 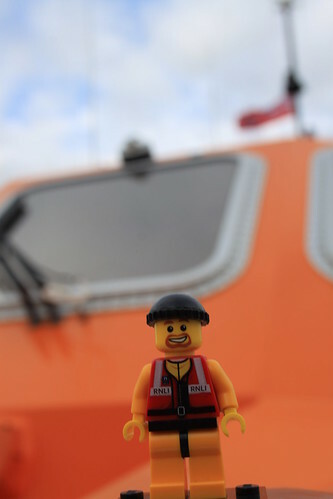 I was already reasonably familiar with this particular sort of lifeboat, as it was a Tamar from which we scattered my Dad’s ashes off the Dorset coast some four years ago, but it was nice to have the chance to look around in somewhat happier circumstances. Matt was clearly extremely fond of the Tamar, with her twin 1,000 horsepower engines, 32 tonne displacement, 4,600 litre fuel capacity, maximum speed of 25 knots and range of 250 nautical miles. With a crew of seven, she can carry up to 44 survivors and still maintain her ability to right herself after a capsize. At a push, and if self-righting ability is overlooked, she can take up to 118. All in all, a highly capable craft. I can see why Matt and his fellow crew members are so proud of her. The main steering position is in the cabin, but there’s a secondary position up on the flybridge. The view of the town from up there was absolutely awesome, and it was easy to imagine the boat coming alongside a casualty in stormy seas, the helmsman looking down from his (or her) vantage point as he (or she) skilfully keeps the two boats just the right distance apart. 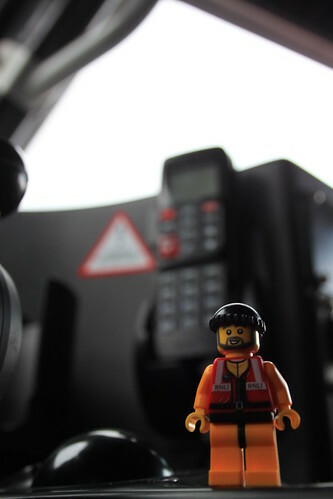 Down in the main cabin, the Crew were overawed by the technology available to their full-sized counterparts. Joysticks, touch screens and tracker balls were very much the order of the day. 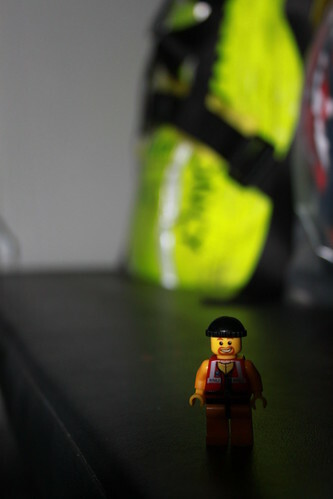 In fact, the crew can operate pretty much every aspect of the boat from the safety of their seats. And even the seats look like something out of Star Trek, designed to protect their occupants from whatever the sea can throw at them. 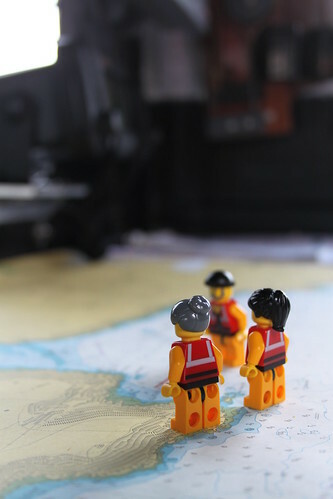 While we were looking around, the Crew stumbled upon a big jar of boiled sweets. 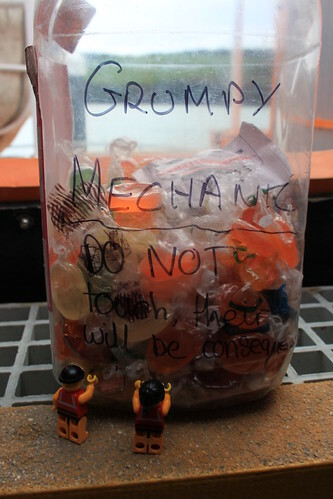 As mechanic Dave and crew member Jackie attempted to hammer their way in, Matt explained that the jar belongs to the station’s own mechanic, who gets it refilled periodically (and for free!) by the friendly people in the local sweet shop. But he is, apparently, very strict about who is allowed to help themselves. 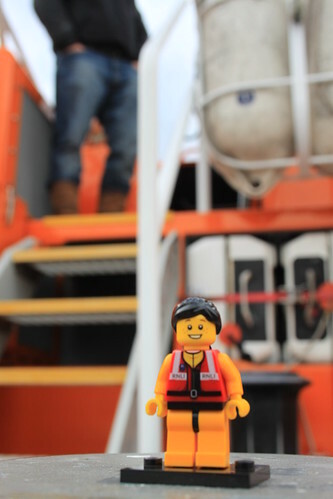 Keen to avoid any kind of incident, we moved the crew swiftly on to the rest of the main cabin, where coxswain Bob instinctively took command. Once again, the Crew marvelled at the technology and at the attention to detail in the way things had been designed. Every aspect of the boat was exactly where you would expect it to be. We didn’t like to think about how much effort it had taken the designers to get things just right, but we were glad that they had. 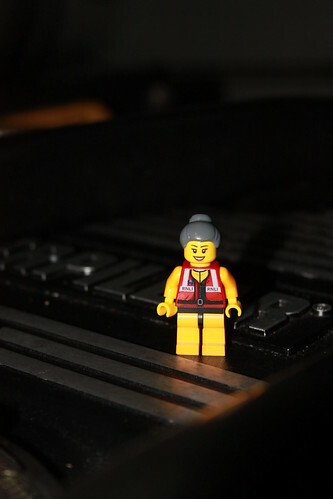 And here’s crew member Susie in the electronics hub. To be honest, I don’t think I’d ever seen anything so complicated in my life. I struggle with the cables coming out of the back of my television, so was very – and I mean very – careful that I didn’t accidentally unplug anything. Having spent a considerable amount of time lurking around in the bowels of the boat, it was refreshing to get back out on deck. Because it’s from here that the complete and utter awesomeness of the Tamar can, in our view, best be appreciated. And it was also time to continue onto the final part of our tour. But that’s a story for another time. Looks like the little guys had another exciting day out. They did indeed. They really do like to get out and about around the coast. As, to be honest, do I.